For my recently installed PXACB I was looking for a way to remotely power it on and off. I found the Wi-Fi Smart Plug "HS100" and a blog post that it can be controlled from the command-line. The referenced script uses captured results from wireshark and just re-transmits these messages from a shell script. In one of the comments someone points out that this is XOR'd JSON and how it can be decoded. Instead of a shell script I re-implemented it in Python and I am now always using XOR to encode and decode the JSON messages without needing to include the encoded commands in my script. This makes it easier to read the script and to extend the script. The protocol used is JSON which is XOR'd and then transmitted to the device. Same goes for the answers. The JSON string is XOR'd with the previous character of the JSON string and the value of the first XOR operation is 0xAB. Additionally each message is prefixed with '\x00\x00\x00\x23'. To find more about which commands the device understands I used the information I got from: Why not root your Christmas gift? The only annoying thing about the smart plug is, that it tries to communicate with some cloud systems so that it could be controlled from anywhere. After starting the smart plug it makes a name lookup for devs.tplinkcloud.com and connects to port 50443. I can connect to that system with openssl s_client -connect devs.tplinkcloud.com:50443 but what the smart plug actually sends to that system I do not know. If I do not block the smart plug in the firewall I see a NTP request after that and then the communication seems to stop. Right now the smart plug is blocked and does no NTP requests but it still tries to reach devs.tplinkcloud.com:50443 once a minute. RPM Fusion's mirrorlist server which are returning a list of (probably, hopefully) up to date mirrors (e.g., http://mirrors.rpmfusion.org/mirrorlist?repo=free-fedora-rawhide&arch=x86_64) still have been running on CentOS5 and the old MirrorManager code base. It was running on two systems (DNS load balancing) and was not the most stable setup. Connecting from a country which has been recently added to the GeoIP database let to 100% CPU usage of the httpd process. Which let to a DOS after a few requests. I added a cron entry to restart the httpd server every hour, which seemed to help a bit, but it was a rather clumsy workaround. 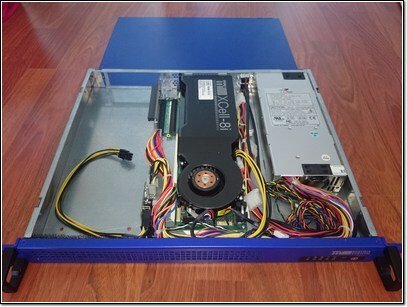 It was clear that the two systems need to be updated to something newer and as the new MirrorManager2 code base can luckily handle the data format from the old MirrorManager code base it was possible to update the RPM Fusion mirrorlist servers without updating the MirrorManager back-end (yet). 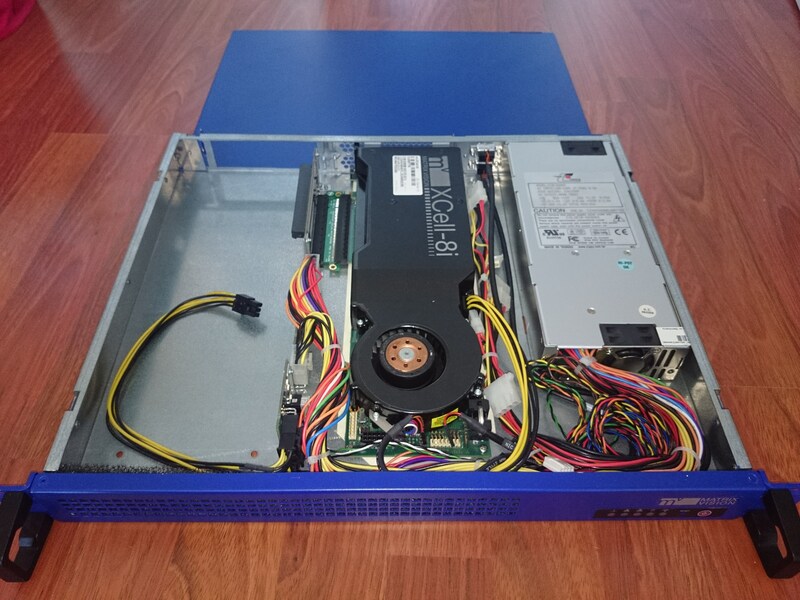 From now on there are four CentOS7 systems answering the requests for mirrors.rpmfusion.org. As the new RPM Fusion infrastructure is also ansible based I added the ansible files from Fedora to the RPM Fusion infrastructure repository. I had to remove some parts but most ansible content could be reused. 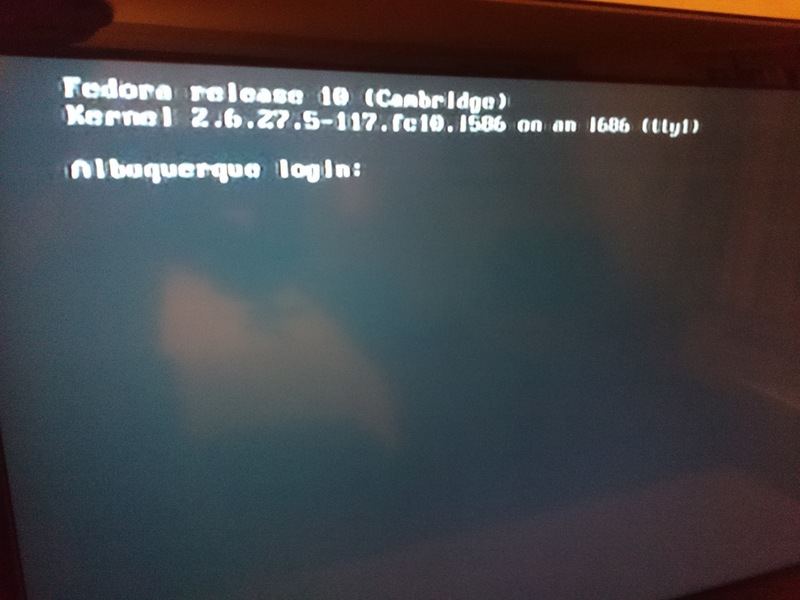 When yum or dnf are now connecting to http://mirrors.rpmfusion.org/mirrorlist?repo=free-fedora-rawhide&arch=x86_64 the answer is created by one of four CentOS7 systems running the latest MirrorManager2 code. RPM Fusion also has the same mirrorlist access statistics like Fedora: http://mirrors.rpmfusion.org/statistics/. I still need to update the back-end system which is only one system instead of six different system like in the Fedora infrastructure. Both issues have been resolved. The first issue, to drop FTP URLs from the metalinks, has been resolved in multiple steps. 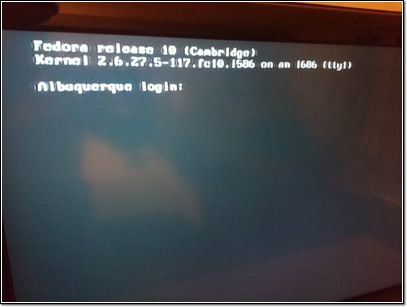 The first step was to block FTP URLs from being added to Fedora's MirrorManager (Optionally exclude certain protocols from MM, New MirrorManager2 features) and the second step, to remove all remaining FTP URLs from Fedora's MirrorManager, was performed during the last few days and weeks. Using MirrorManager's mirrorlist interface (which is not used very often) only returned FTP if the mirror had no HTTP(S) URLs. So it was already rather unusual to be redirected to a FTP mirror. Using MirrorManager's metalink interface returned all possible URLs for a host. With the removal of all FTP URLs from MirrorManager's database no user should see FTP URLs any more and the problems some clients encoutered (see Drop ftp:// urls from metalinks) should be 'resolved'. To have more HTTPS based mirrors in our database we scanned all existing public mirrors to see if they also provide HTTPS. With this the number of HTTPS URLs was increased from 24 to over 120. The option to select which protocol the mirrorlist/metalink mirrors should provide is not yet running on the production instance. 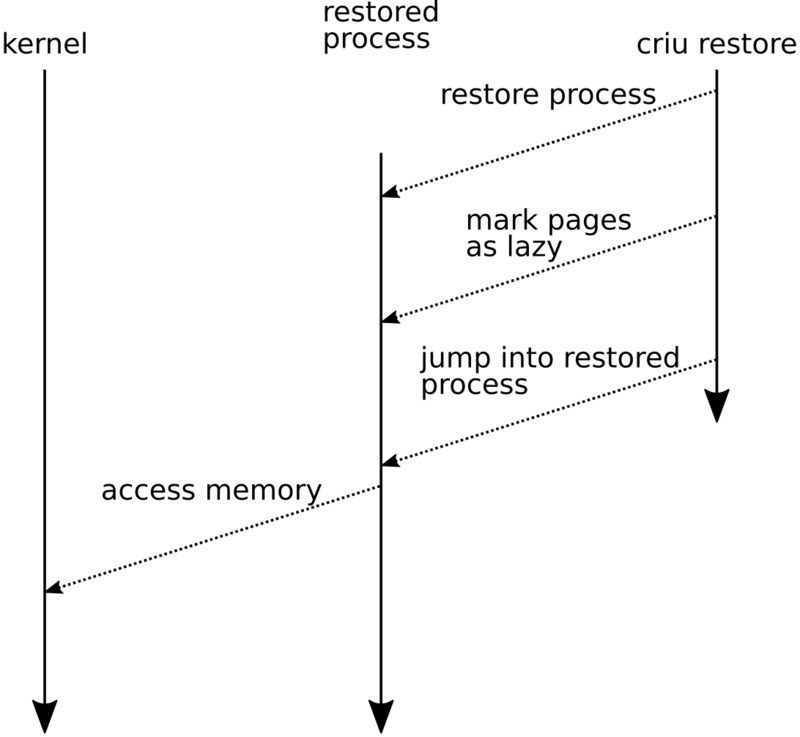 Using CRIU it is possible to checkpoint/save/dump the state of a process into a set of files which can then be used to restore/restart the process at a later point in time. If the files from the checkpoint operation are transferred from one system to another and then used to restore the process, this is probably the simplest form of process migration. For large processes the migration duration can be rather long. For a process using 24GB this can lead to migration duration longer than 280 seconds. The limiting factor in most cases is the interconnect between the systems involved in the process migration. One existing solution to decrease process downtime during migration is pre-copy. In one or multiple runs the memory of the process is copied from the source to the destination system. With every run only memory pages which have change since the last run have to be transferred. This can lead to situations where the process downtime during migration can be dramatically decreased. This depends on the type of application which is migrated and especially how often/fast the memory content is changed. In extreme cases it was possible to decrease process downtime during migration for a 24GB process from 280 seconds to 8 seconds with the help of pre-copy. This approach is basically the same if migrating single processes (or process groups) or virtual machines. 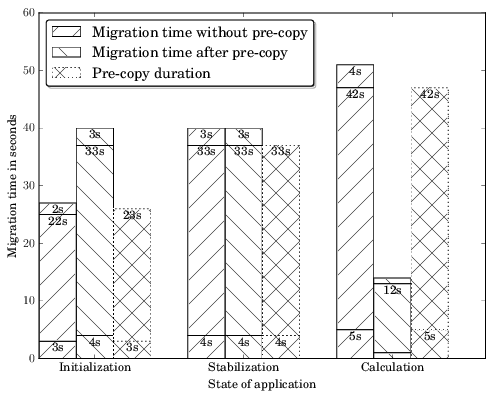 In the example above a process has been migrated during three stages of its lifetime and there are situations (state: Calculation) where pre-copy has enormous advantages (14 seconds with pre-copy and 51 seconds without pre-copy) but there are also situations (state: Initialization) where the pre-copy optimization increases the process downtime during migration (40 seconds with pre-copy and 27 seconds without pre-copy). It depends on the memory change rate. Thanks to userfaultfd this approach (or optimization) can be now integrated into CRIU. With the help of userfaultfd it is possible to mark memory pages to be handled by userfaultfd. 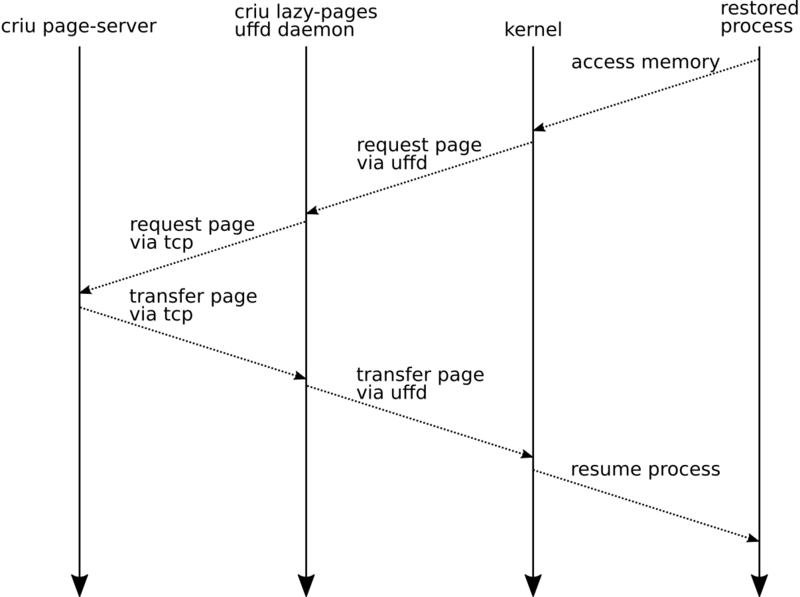 If such a memory page is accessed, the process is halted until the requested page is provided. The listener for the userfaultfd requests is running in user-space and listening on a file descriptor. The same approach has already been implemented for QEMU. The socket specified with --address is used to exchange information about the restored process required by the uffd daemon. 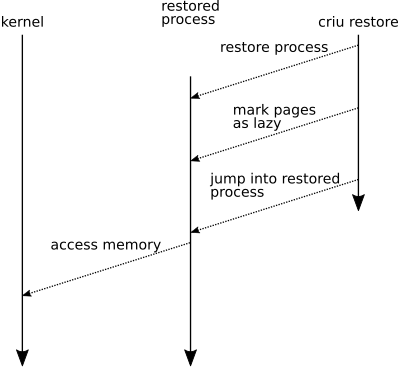 Once criu restore has done all its magic to restore the process except restoring the lazy memory pages, the process to be restored is actually started and runs until the first userfaultfd handled memory page is accessed. 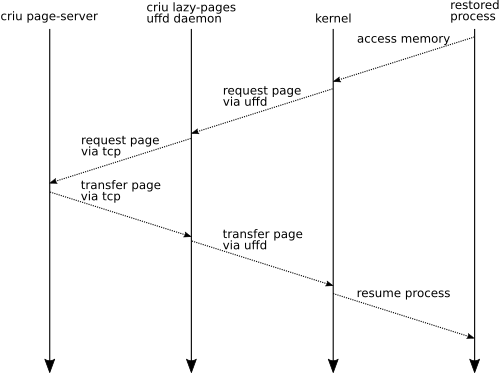 At that point the process hangs and the uffd daemon gets a message to provide the required memory pages. Once the uffd daemon provides the requested memory page, the restored process continues to run until the next page is requested. As potentially not all memory pages are requested, as they might not get accessed for some time, the uffd daemon starts to transfer unrequested memory pages into the restored process so that the uffd daemon can shut down after a certain time.